Heavy Vee have a range of delivery methods to suit you and your staff. HOURLY– You can do one hour a day or one hour per week, whatever suits you and your business. TWO DAY COURSE – You start with a four hour training session on a separate day then, there is a two hour drive followed by a test with QLT. This method has a very high success rate if you DO need any extra training it is charged at the hourly rate for your class this only done to insure you are confident and pass. MR & HR Courses. ONE DAY COURSE – One day courses start early morning and finish with a test mid afternoon with QLT. 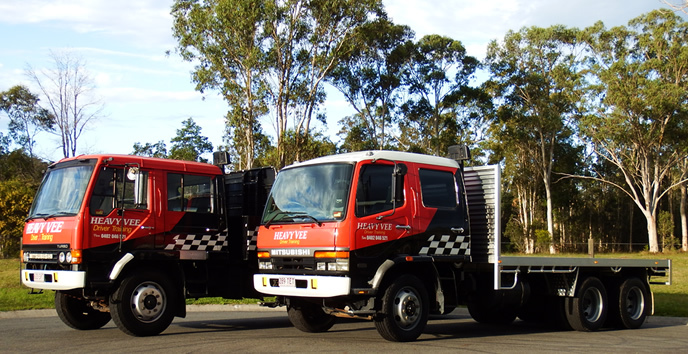 GROUP DRIVER TRAINING – is a new concept to QLD. It has been used in other states throughout Australia and offering discounts and quality driver training. For eg. two/three trainees would come for one day and rotate on one hour drives. On another day it would be a two hour drive followed by a test with QLT. All courses cover training hire of truck for one hour test QLT booking fee the only other fee is a written test with QLT $23.90 (subject to change). Reduce downtime of staff with our effective training methods or group driver training options. Heavy Vee’s pricing is affordable. Visit out Price List for more information. This course consists of 2 trainees rotating in 1 hour drives. An individual test is set up with QLT at a location on the Sunshine Coast. This course is for the budget minded however, students must be prepared to share the vehicle for the training. This course also has a very good success rate and is a lot of fun. CONDITIONS: Balance of course fees must be paid on the day of training. If there is a cancellation, course will revert to a 1 or 2 day course with balance payable. View the rest of our pricing to see what suits you. MR & HR Courses.